Whether you’re running, playing a pickup game of basketball or going for a power walk, take care when the temperatures rise. If you exercise outdoors in hot weather, use these common-sense precautions to prevent heat-related illnesses. Exercising in hot weather puts extra stress on your body. 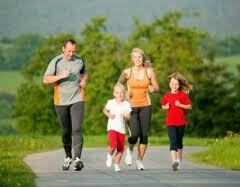 If you don’t take care when exercising in the heat, you risk serious illness. Both the exercise itself and the air temperature increase your core body temperature. The result may be a heat-related illness. Heat-related illnesses occur along a spectrum, starting out mild but worsening if left untreated. • Heat cramps. Heat cramps are painful muscle contractions. Affected muscles may feel firm to the touch. Your body temperature may be normal. • Heat syncope and exercise-associated collapse. Heat syncope is a feeling of lightheadedness or fainting caused by high temperatures, often occurring after standing for a long period of time, or standing quickly after sitting for a long period of time. Exercise-associated collapse is feeling lightheaded or fainting immediately after exercising, such as after a race. • Heat exhaustion. With heat exhaustion, your body temperature rises as high as 104 F (40 C), and you may experience signs and symptoms including nausea, vomiting, headache, weakness, and cold, clammy skin. If left untreated, this can lead to heatstroke. • Heatstroke. Heatstroke is a life-threatening emergency condition that occurs when your body temperature is greater than 104 F (40 C). Your skin may be hot, but your body may stop sweating to help cool itself. If your heatstroke occurs during exercise in hot, humid weather, you may continue to sweat for a short time after exercising. If you develop any of these symptoms, you must lower your body temperature and get hydrated. Stop exercising immediately and get out of the heat. If possible, have someone stay with you who can help monitor your condition. Remove extra clothing or sports equipment. If possible, fan your body or wet down your body with cool water. You may place cool, wet towels or ice packs on your neck, forehead and under your arms, spray yourself with water from a hose or shower, or sit in a tub filled with cold water. Drink fluids — water or a sports drink. If you don’t feel better within 30 minutes, contact your doctor. If you have signs of heatstroke, seek immediate medical help. cleared by your doctor before you return to exercise if you’ve had heatstroke. When you exercise in hot weather, keep these precautions in mind:• Watch the temperature. Pay attention to weather forecasts and heat alerts. Know what the temperature is expected to be for the duration of your planned outdoor activity. • Get acclimated. If you’re used to exercising indoors or in cooler weather, take it easy at first when you exercise in the heat. As your body adapts to the heat over the course of one to two weeks, gradually increase the length and intensity of your workouts. • Drink plenty of fluids. Dehydration is a key factor in heat illness. Help your body sweat and cool down by staying well-hydrated with water. Don’t wait until you’re thirsty to drink fluids. • Dress appropriately. Lightweight, loosefitting clothing helps sweat evaporate and keeps you cooler. Avoid dark colors, which can absorb heat. If possible, wear a light-colored, wide-brimmed hat. • Avoid midday sun. Exercise in the morning or evening, when it’s likely to be cooler outdoors. If possible, exercise in shady areas — or do a water workout in a pool.